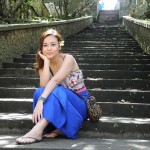 What do you look out for when planning for a family holiday in Bali? Good location, comfort and great prices – a combination of these three factors often determines whether you decide to book that villa. Some say it’s nearly impossible to get a place with all three, but we beg to differ. Who says you have to decide between sacrificing a good night’s sleep to keep to your budget and location or renting a cheaper and more comfortable villa but stay in a remote area? 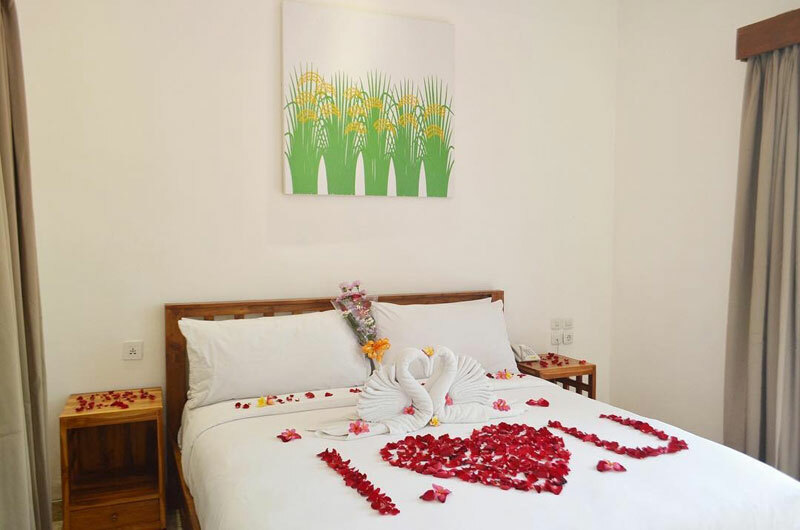 You can actually enjoy comfortable luxurious stays in town that are affordable (under USD 136 a night!) 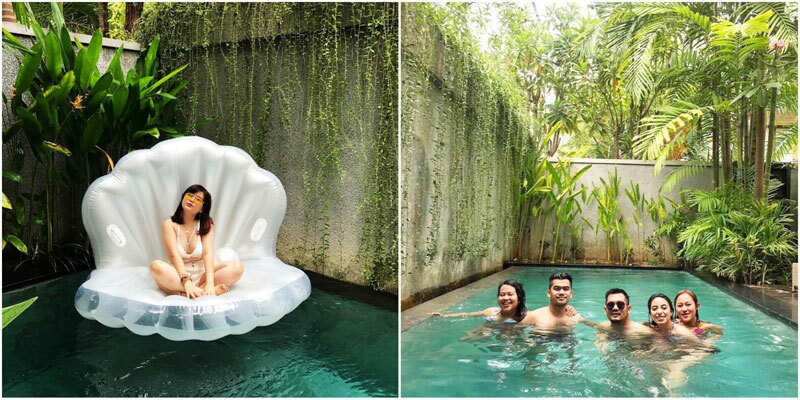 – and they even come with a private pool! We’ve dug them all out for you. So what are you waiting for? 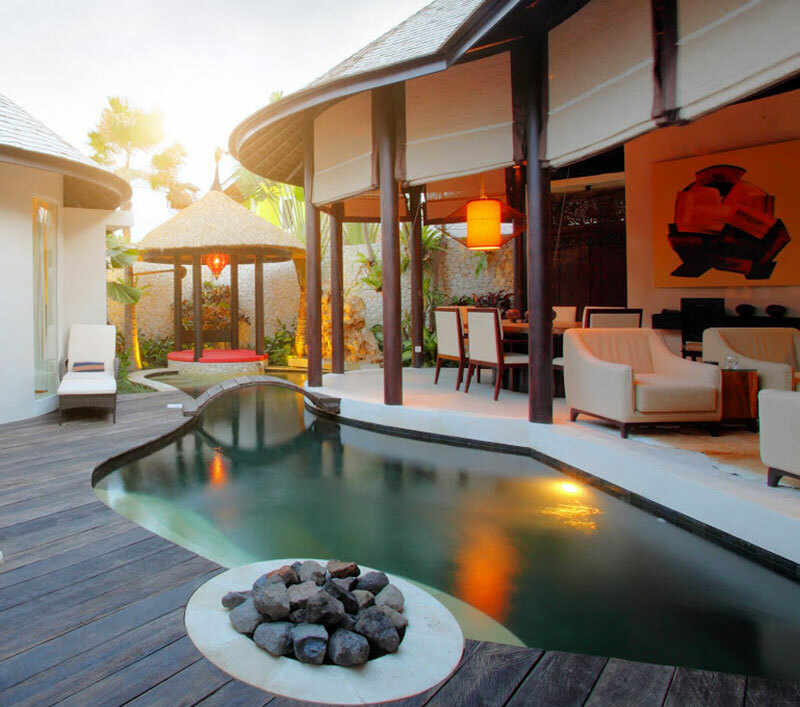 Inspired by the Mediterranean and Balinese architectures, Danoya Villa is all about lavish style and comfort minus the high prices. 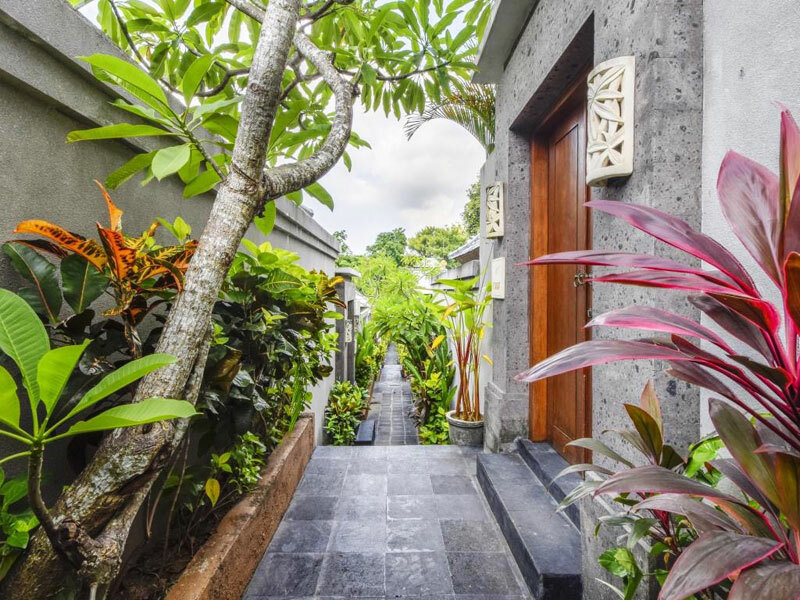 Boasting of an open-air concept, these private villas blend modern and natural elements together, combining luxury with a laid-back Indonesian touch. 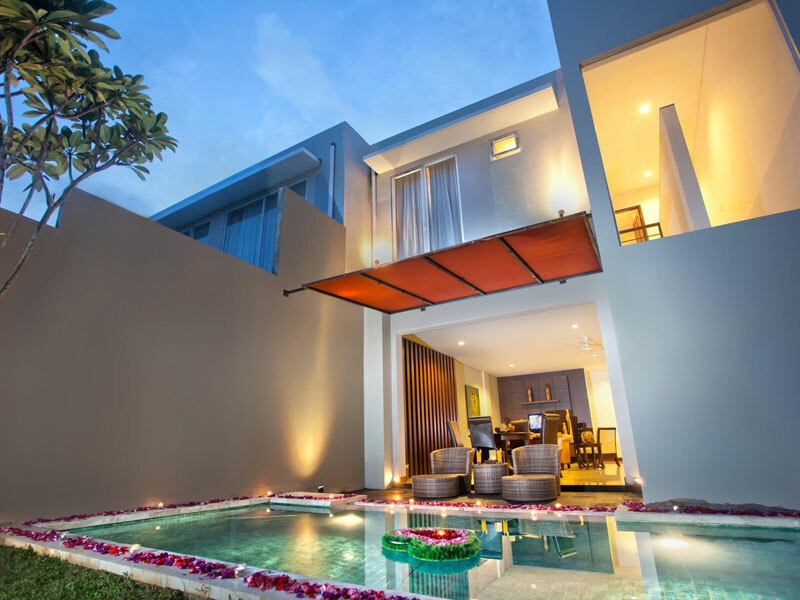 You can choose from their Imperial two-bedroom villas and Royal two-bedroom villas. 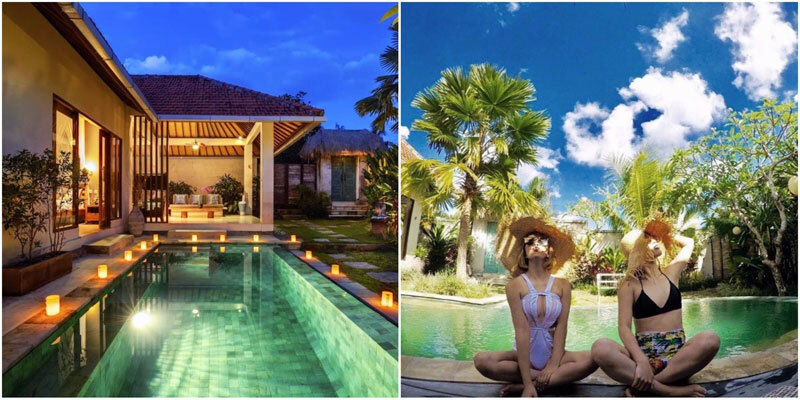 They are both equipped with a private swimming pool and similar amenities, except that the Imperial villas come with king-sized beds while Royal Villas come with queen-size beds in each room. And Batu Belig beach is just a 15-minute walk away, so you can take a refreshing walk at night with your family before bedtime. 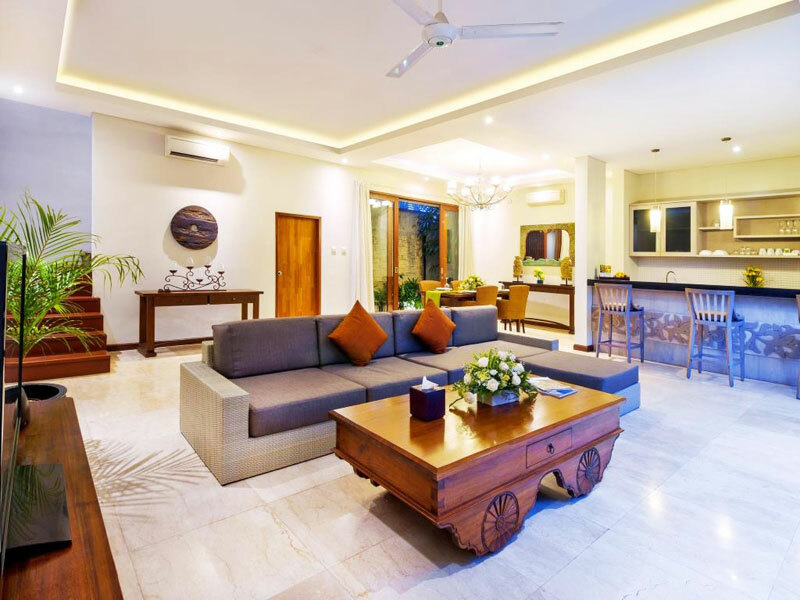 Located fairly near the popular Oberoi, all you need to do is to hop onto the free shuttle service and you’ll be brought to the hippest area in Seminyak with all the brilliant restaurants and shops – isn’t that simply convenient? 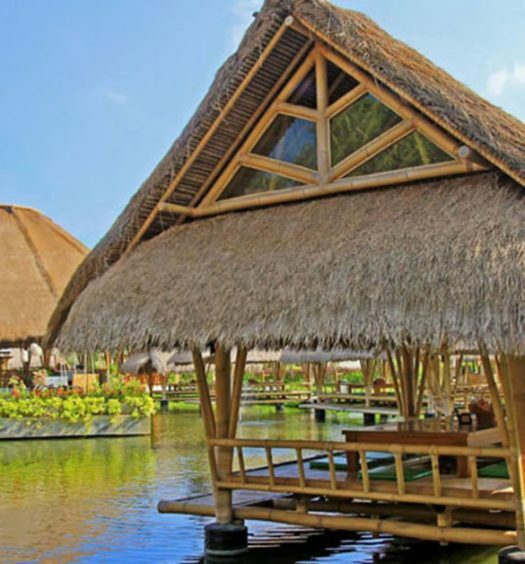 With its curved veranda and pool that come right up, Sandi Kala Villas resemble a house floating on water (think water villas), which is a rare sight in Bali. The pool fits in with the villa in the most organic way, resembling a river and flows under a small bridge. If you’re still not sold, there’s also a fire pit on the pool deck, so you can actually take a night time dip and warm up by the outdoor fireplace. 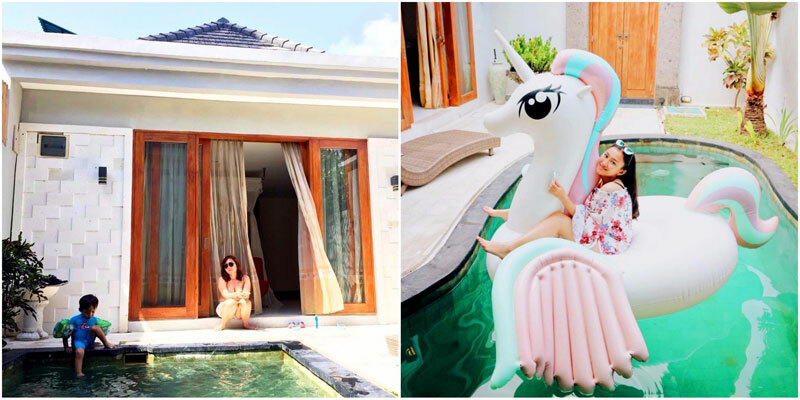 Imagine a vacation in a whimsical villa with a rattan swing by the pool, a floating breakfast and a rainbow unicorn float on the pool. 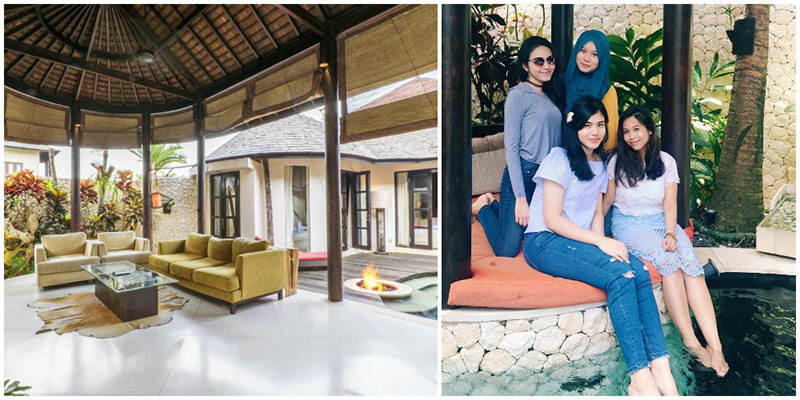 You can find all these in Ini Vie Villa, one of the latest trending villas in Legian that will have all the young ladies going crazy on Instagram as they pose for pretty photos in this truly photogenic villa. 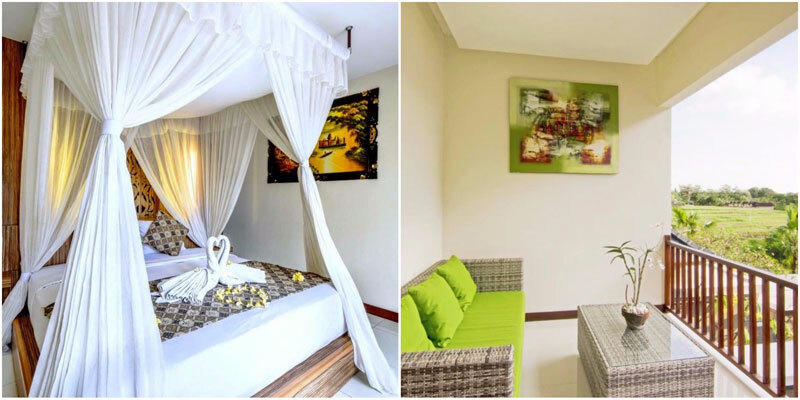 With a total of 8 one-bedroom and 2 two-bedroom villas in the complex, this accommodation is amazingly well-furnished and spacious. 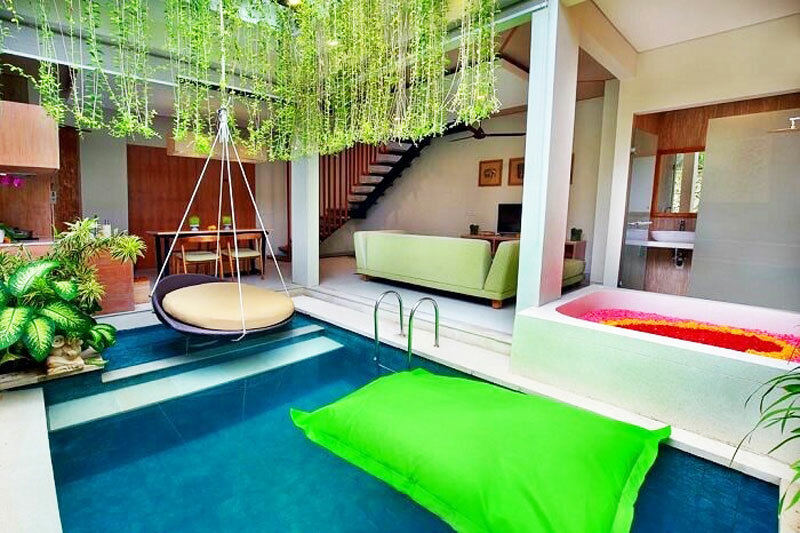 Look, you can even step right into the private pool from your bedroom! Wouldn’t it a refreshing start to your day? 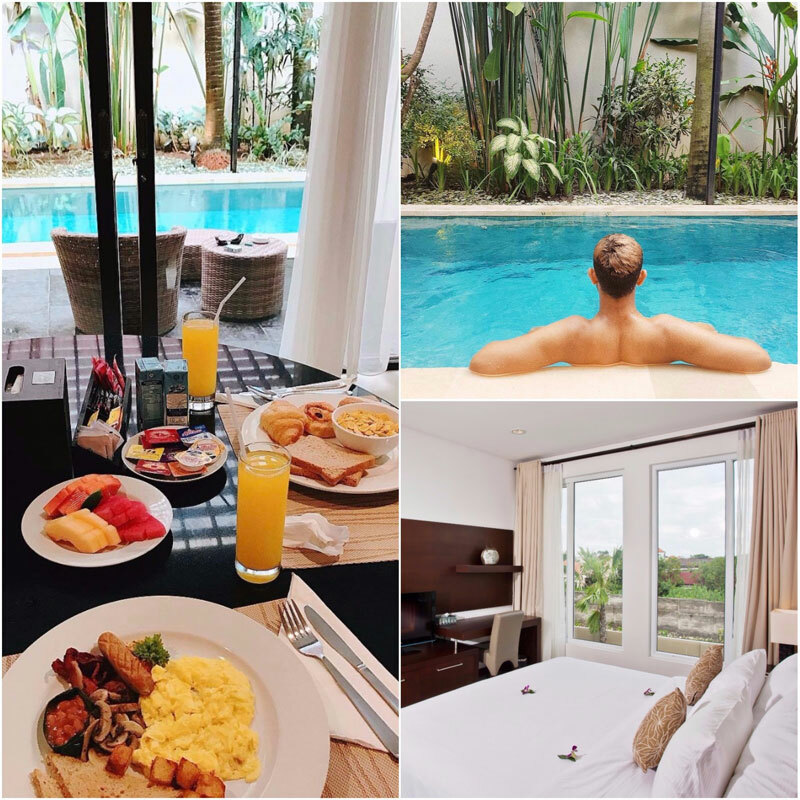 After your morning swim, you can simply wade up to your floating breakfast – you don’t even need to get up from the pool! 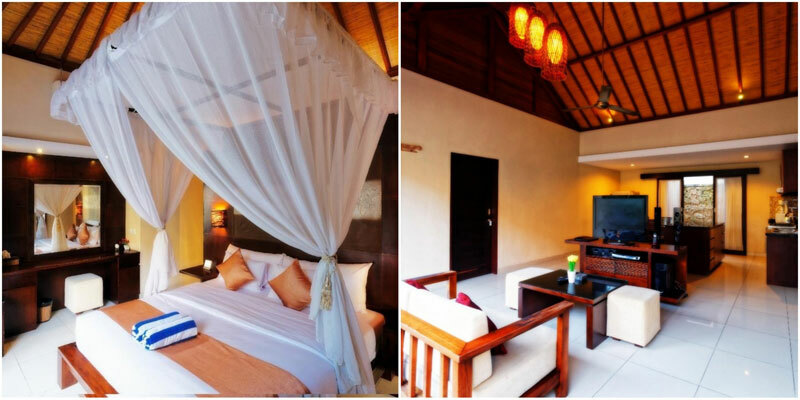 And if you are tired of staying indoors, Legian beach and Double-Six beach are just less than two kilometres away! 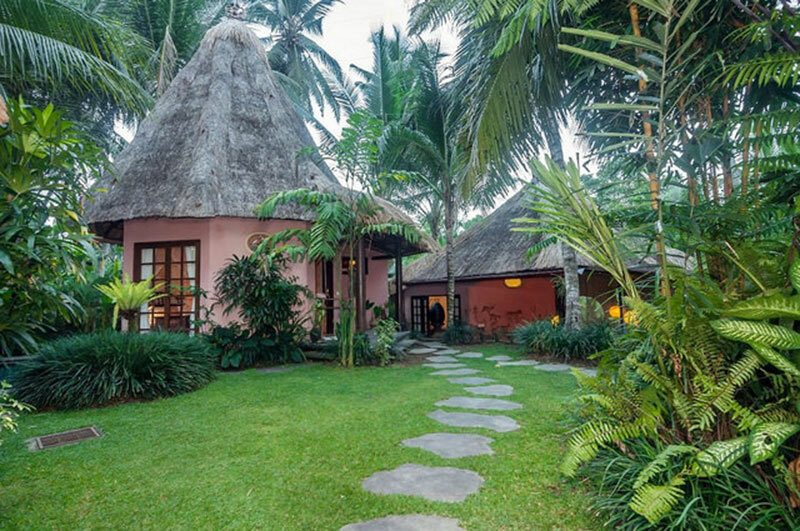 As the name “pandan” (the famous South Asian leaves commonly used to bring extra fragrance into local dishes) suggests, this villa presents a naturally organic paradise in the heart of Canggu. 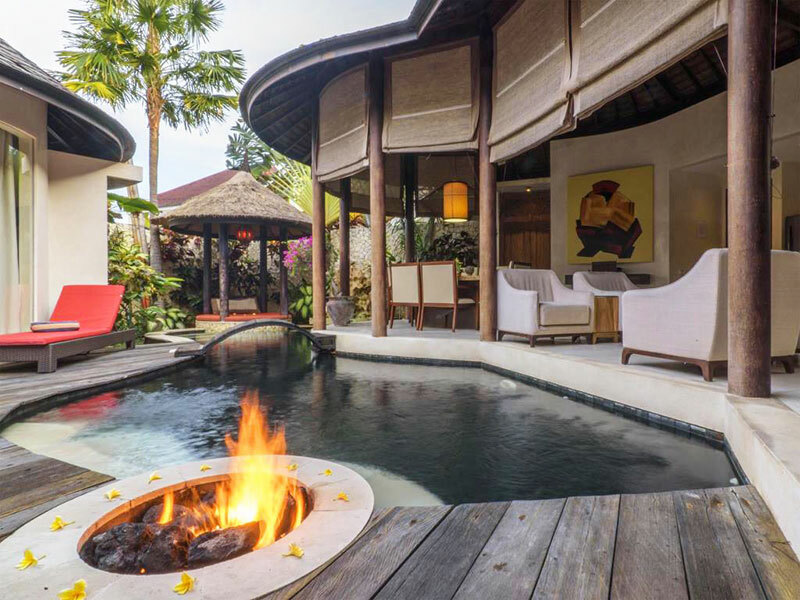 Boasting of an open-space concept with old rustic elements, the exclusive complex of Pandan Tree Villa consists of only 3 exuberant villas, each with its own character and distinct feature. 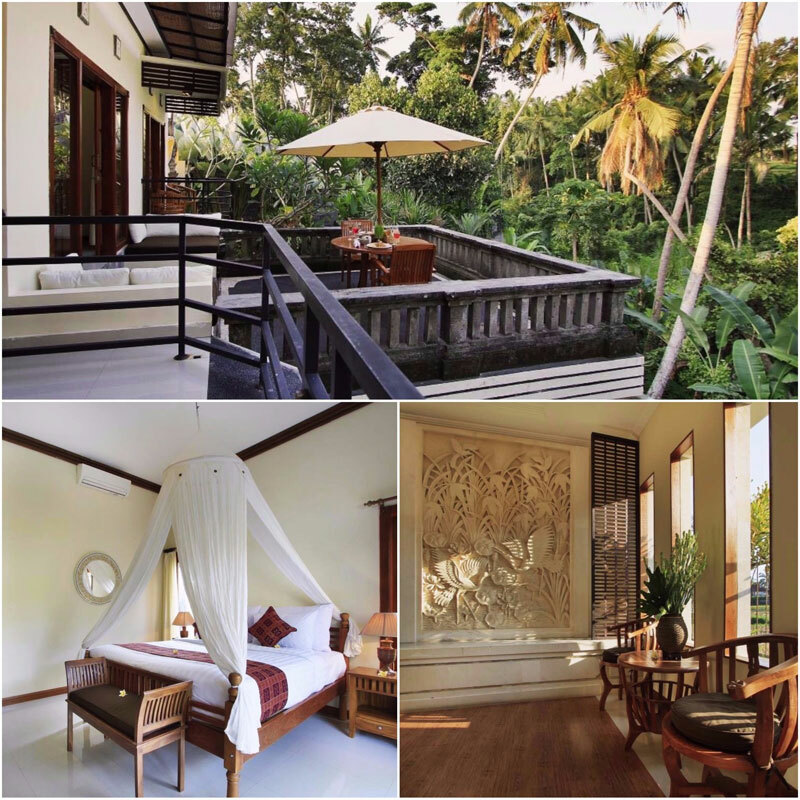 They are the one-bedroom Villa Cinta (The Love Villa), the two-bedroom Villa Prana and another two-bedroom Villa Yoga. 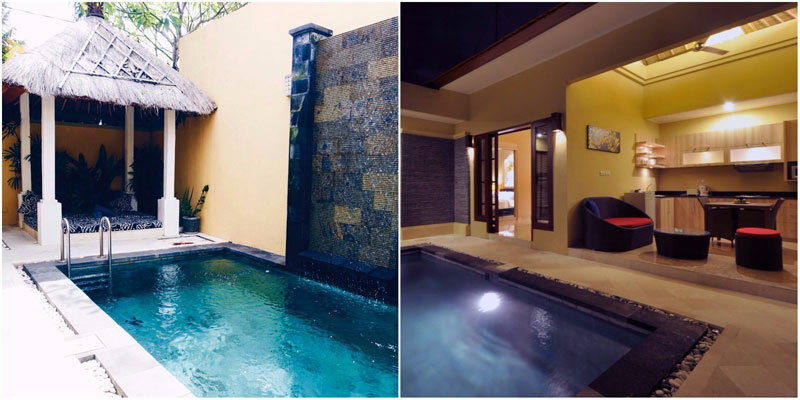 With a private pool on the standby, you can enjoy a quiet dip or splashy fun swimming time. While you’re here, don’t forget to check out Echo beach and Batu Bolong beach, which are just 5 to 10 minutes’ drive away. 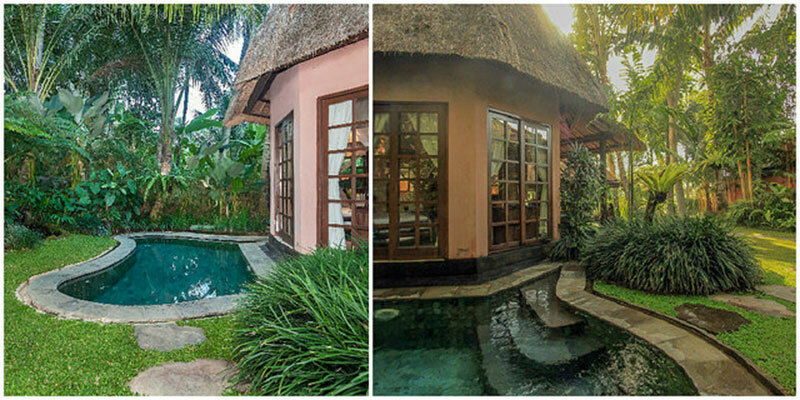 Set in tranquil tropical greenery, Villa Swara Hari is an unpretentious yet comfortable accommodation that is perfect for a quiet family vacation. 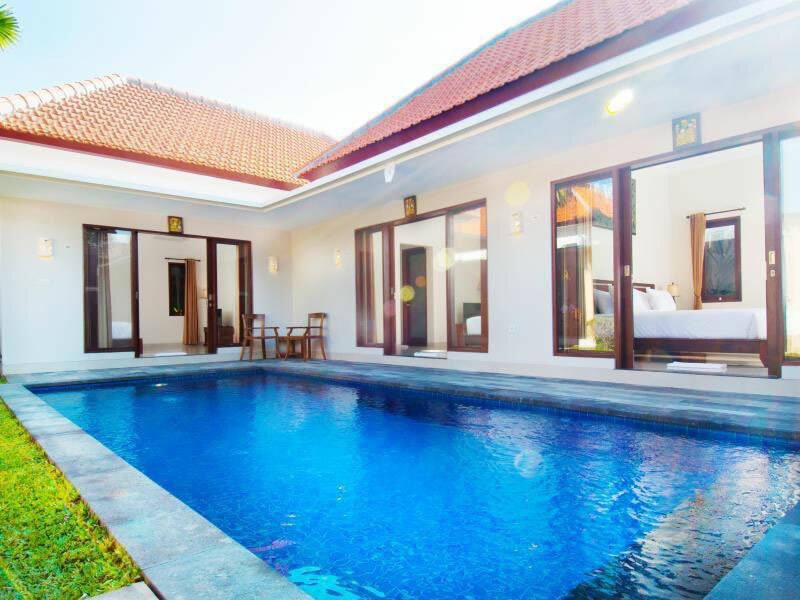 With a decently-sized private pool right in front of the villa, you and your family will enjoy taking a blissful dip while relishing in the resting area complete with lazy chairs. 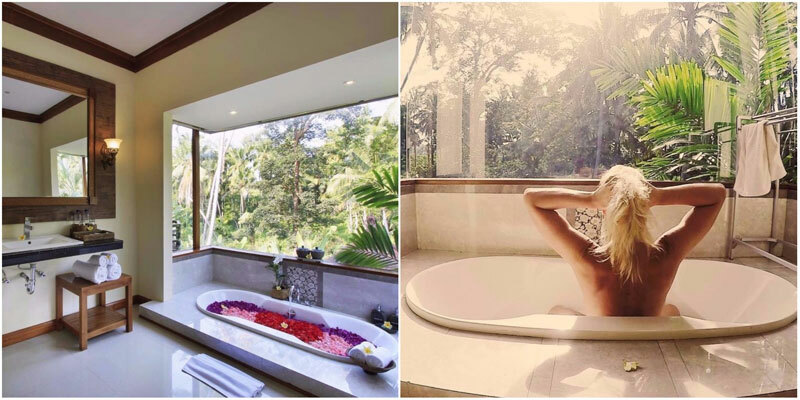 The villa is also an indulgence of its own, where you can soak in cozy bathtubs while enjoying the view of the greenery. 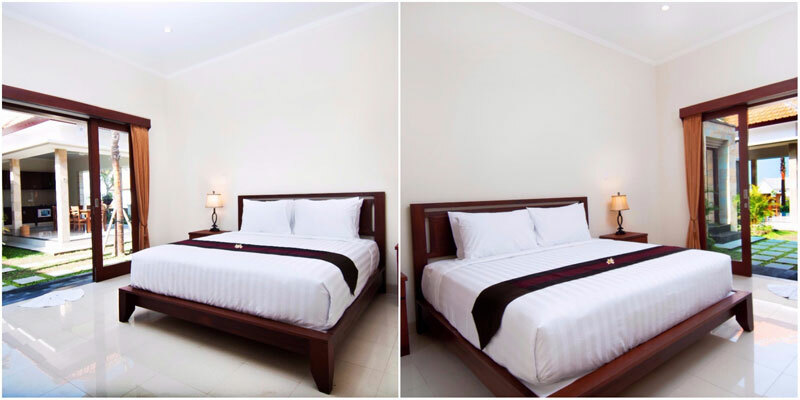 The Balinese-style plush bedding will cater to all your comforts, and you’ll also get personalized care for your breakfast and every need. 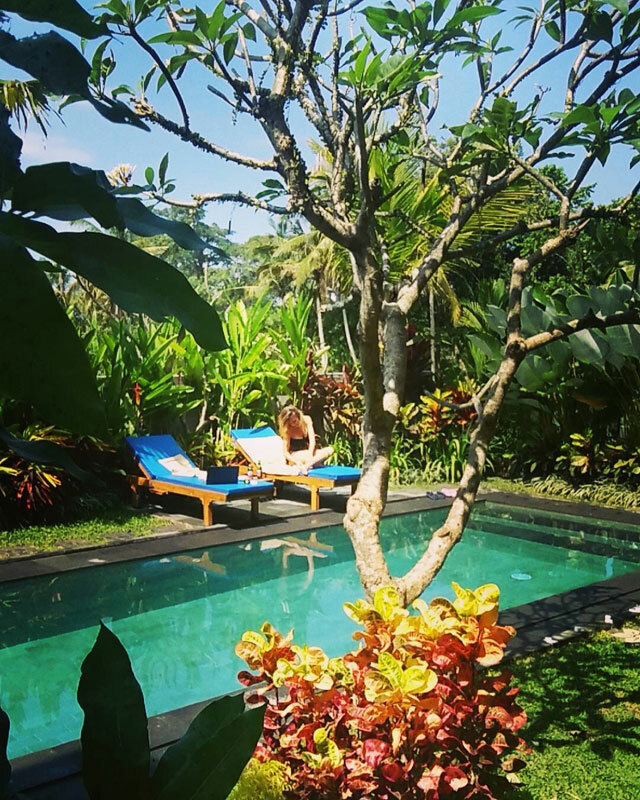 What’s more, all you need to do is to drive out for 10 minutes and you’ll reach the bustling central Ubud, or drive for 15 minutes to the popular Monkey Forest! 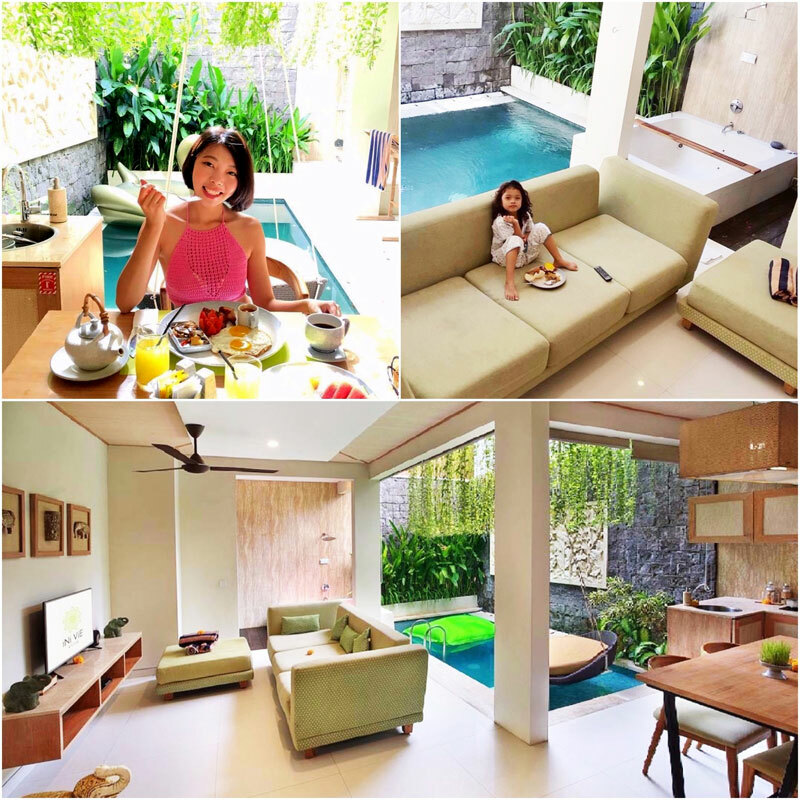 Located in Tampaksiring of Ubud, with a signature view of tranquil lush paddy fields, a spacious setting, a big verandah and complete with a large private pool in a lovely garden, it’s easy to see why Dewi Sri Private Villa is a favorite choice for families with children. 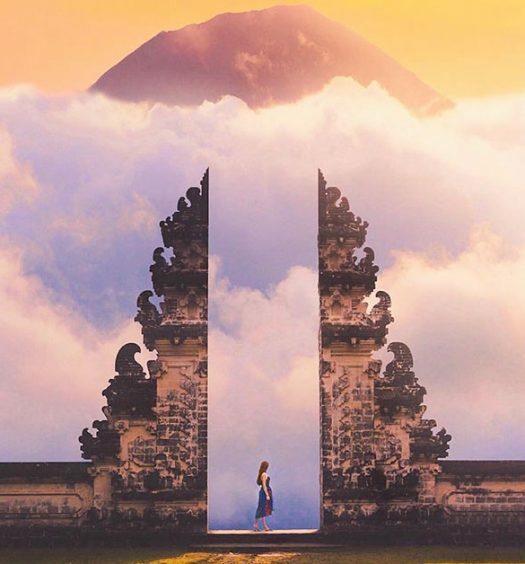 Although not in central Ubud, commuting is fairly convenient because the daily shuttle service to and from Ubud central is available until late in the evening. 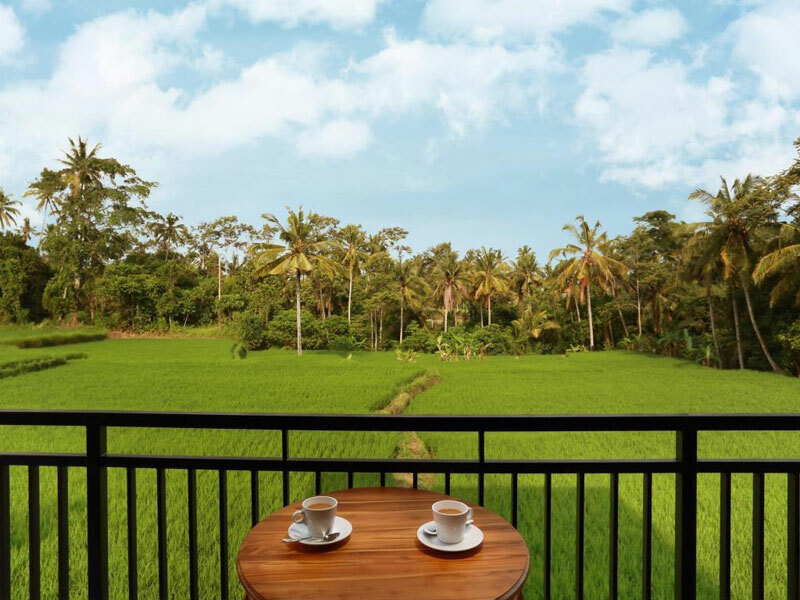 So you can pack the kids in tow anytime for a trip down to Ubud Market or Ubud Palace that’s just a few kilometres away! 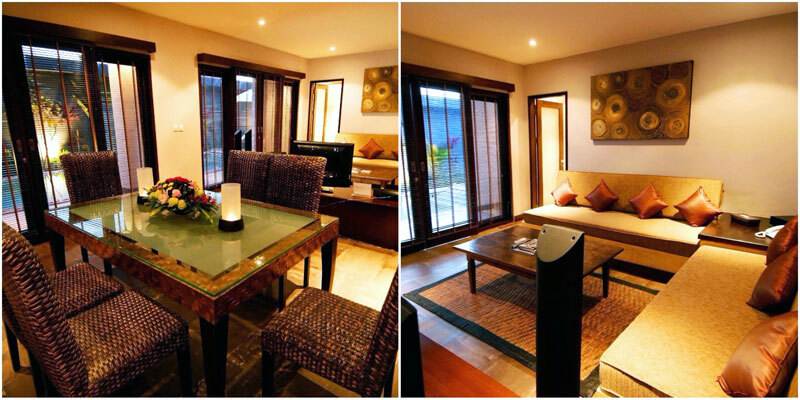 Located in the centre of Kerobokan, this little gem provides access to Kuta and Seminyak with absolute ease. 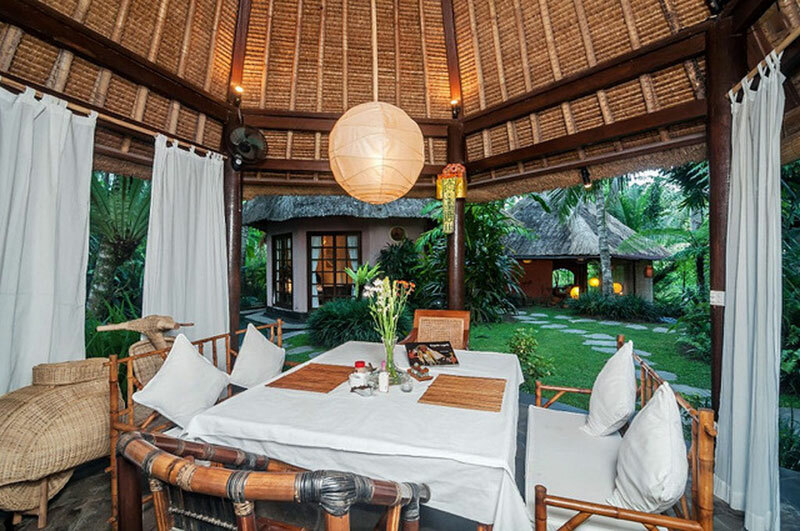 As one of the favourite villas in the area, it takes less than 20 minutes (by car) to reach Seminyak Square where you can check out all the must-dine restaurants, bars and shops, including Ku De Ta and Potato Head Beach Club. 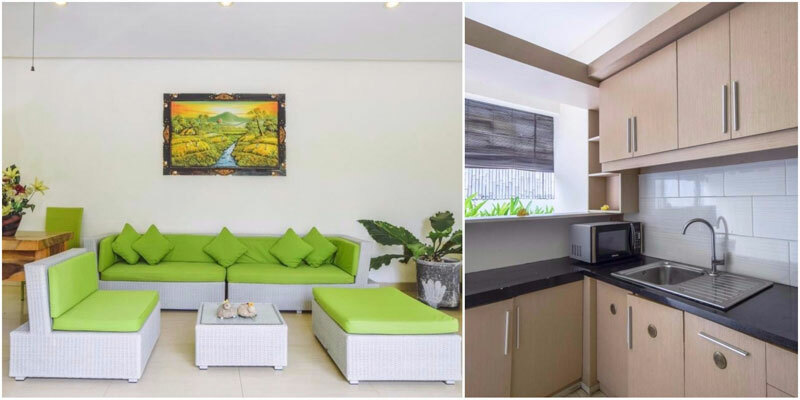 With just 9 units of one-bedroom and 2 units of two-bedroom villas available, the latter comes with its own private pool and a set of plush reclining chairs. 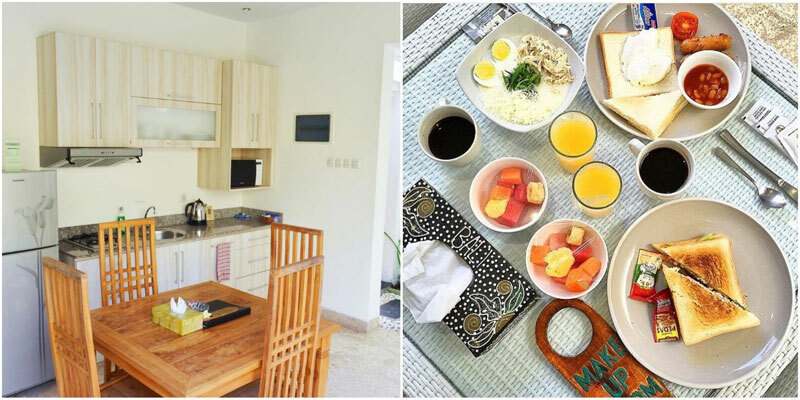 The spacious villa offers a generous kitchen, bedrooms with a king-sized bed and twin beds, and a complete set of villa amenities. Together with attentive staff and a well-maintained property, this villa is a good value-for-money accommodation overall. And whenever you’re ready to explore, take a stroll or hop on a bike to take in the quiet and relaxed atmosphere in Kerobokan. 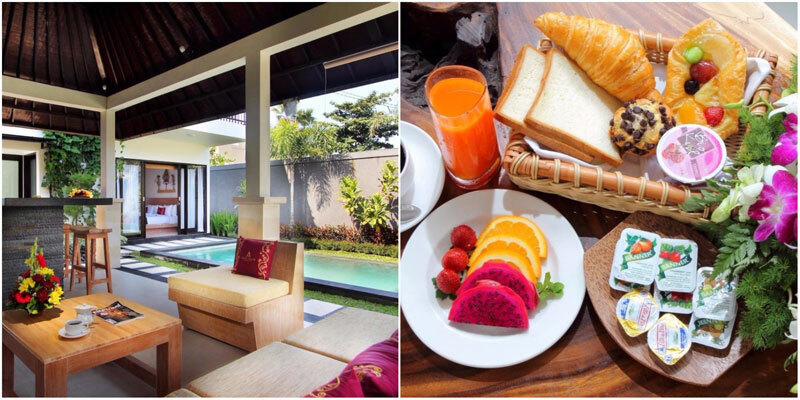 Arman Villa Seminyak offers a comfortable respite for families with all the convenience of modern living. 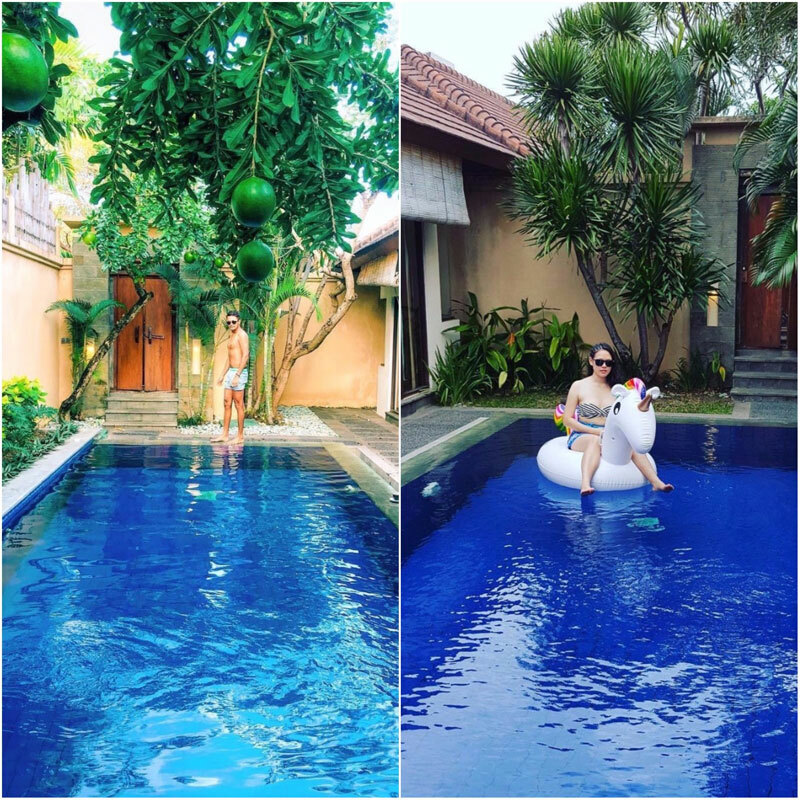 Nestled in the centre of Seminyak, it takes just about 10 minutes by car to reach everywhere you need to visit in Kuta and Seminyak. The nearest beach is also just a six-minute walk away. 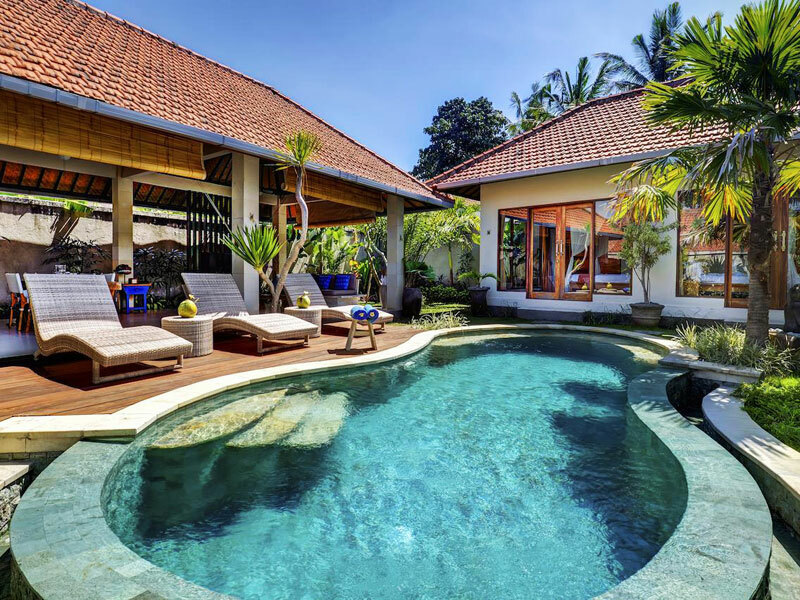 With a semi open-space concept, this villa oozes a laid-back allure that is synonymous with the definition of a relaxing holiday. 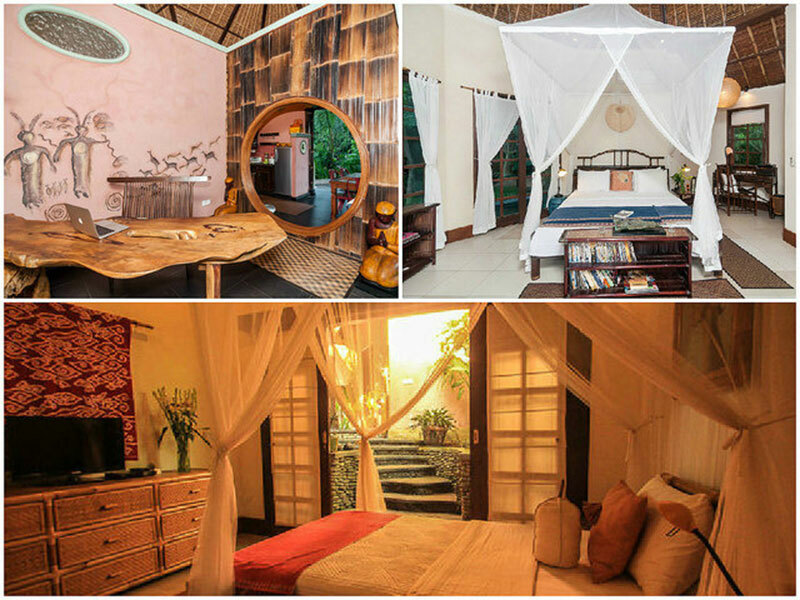 Don’t miss the charming low-set beds equipped with mosquito nets. 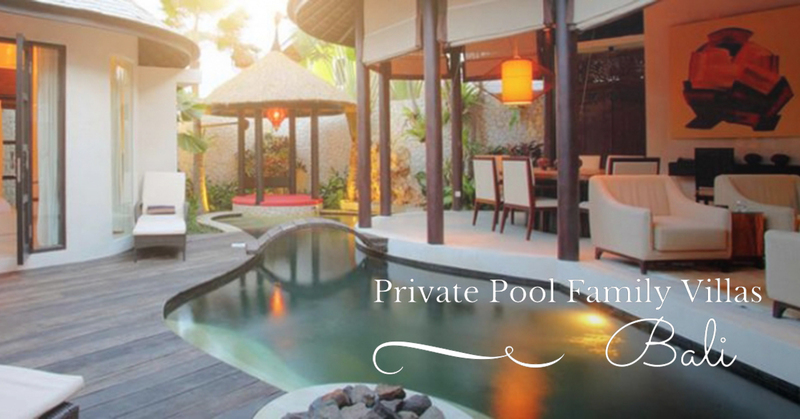 Your family will definitely enjoy the spaciousness of the two-bedroom villa with a large plunge pool. 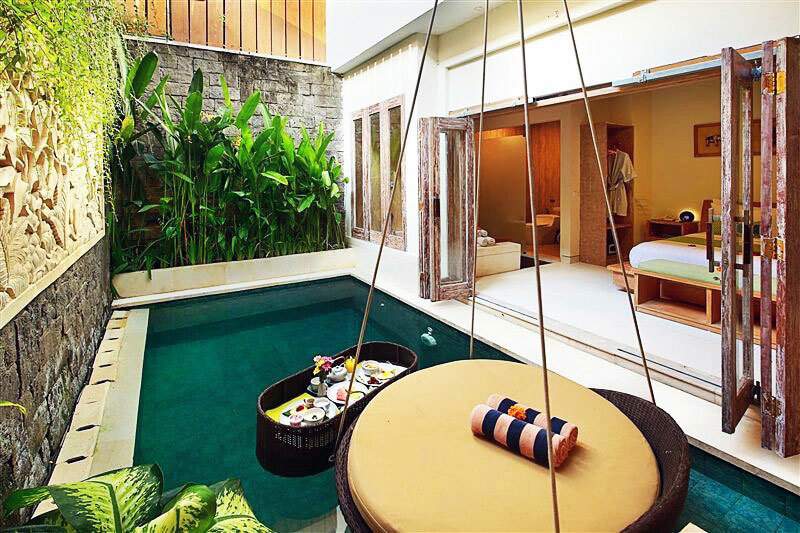 Although located in the heart of Seminyak, Bali’s most happening hotspot, The Jas is tucked away in a quiet alley, ensuring that you get all the peace and quiet you need with your family while being just steps away from all the trendiest shops, cafes and bars. In fact, everything’s just a three-minute walk away! 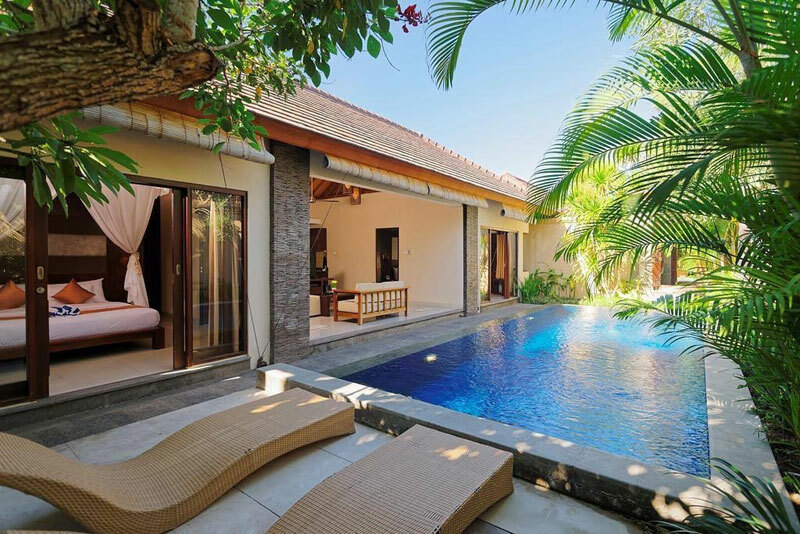 Opt for the two-bedroom villas, which come with a small kitchenette and a bale for resting – all of which overlook a refreshing private pool that the entire family can have fun in. 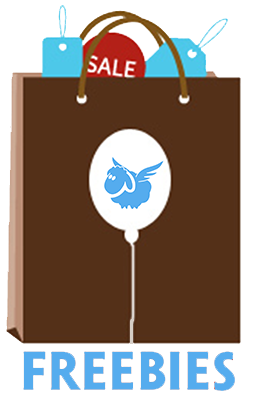 You will also enjoy a personalized service – a value-for-money and convenient stay in the middle of all the excitement! 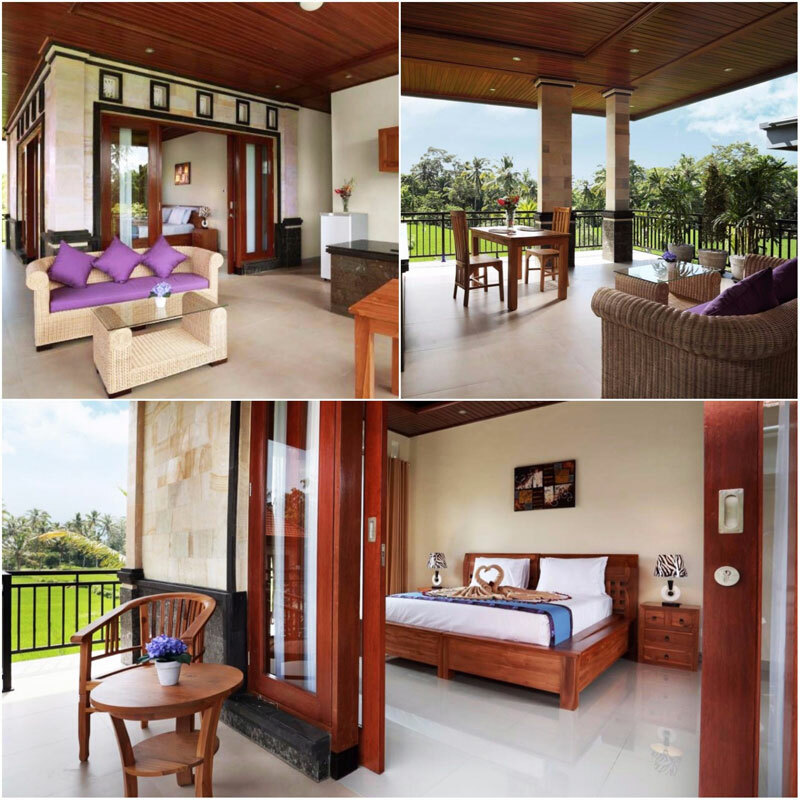 Situated in Canggu, Kei Residence boasts of good value and accessibility to Berawa Beach. 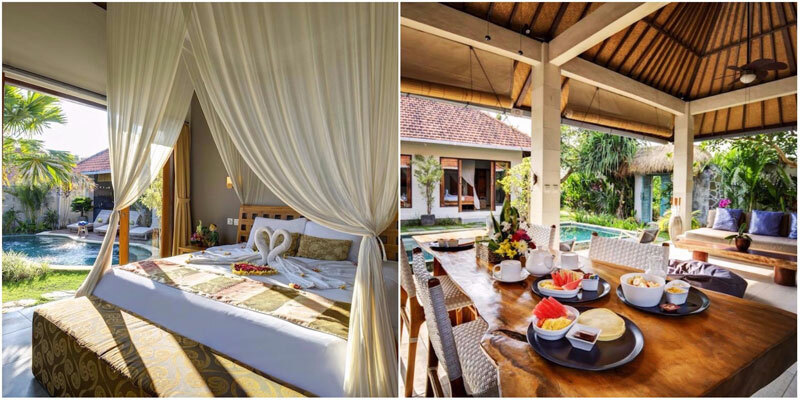 Each villa comes with a private pool and bedrooms that are decked in stylish furnishing, with a touch of local artistry for a signature Balinese stay. 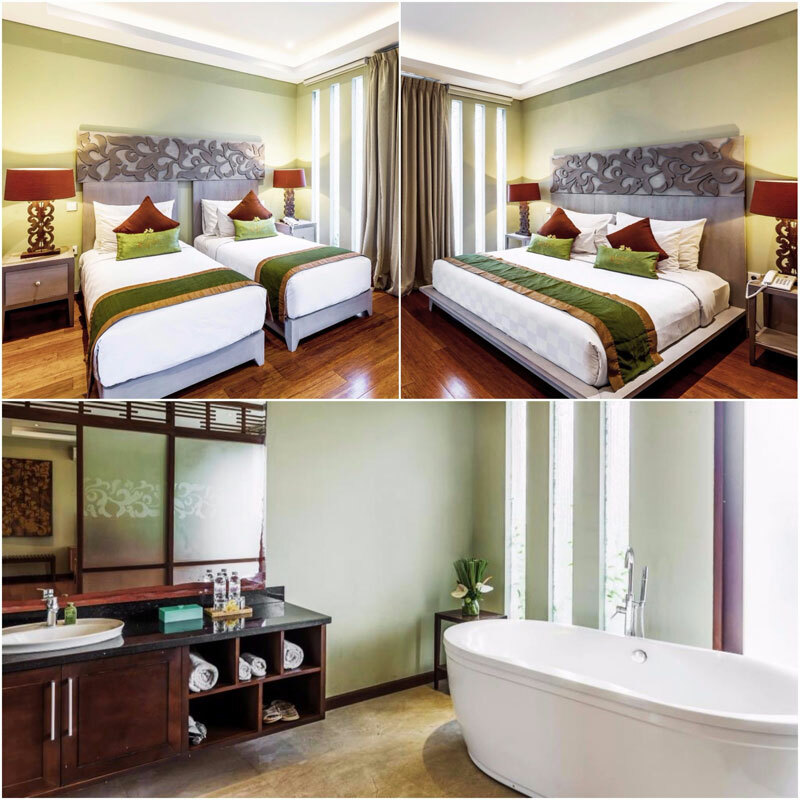 The lavish decor is further enhanced by the spacious rooms and a sparkling swimming pool your kids will love. 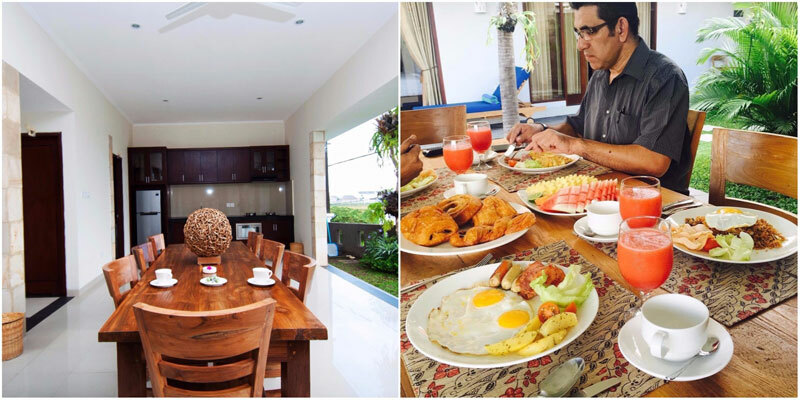 Kei Residence also goes by its old name “Villa Kedis” and is well-known for its top notch and impeccable guest care by its attentive staff. 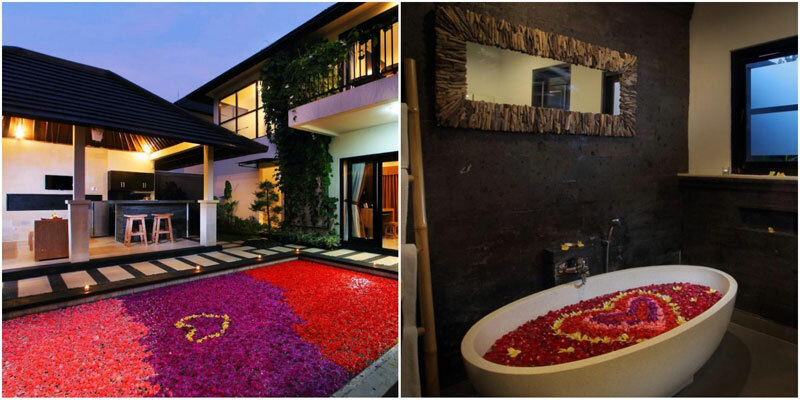 And with just 3 villas in its exclusive complex, you can expect extra personalised and meticulous service. 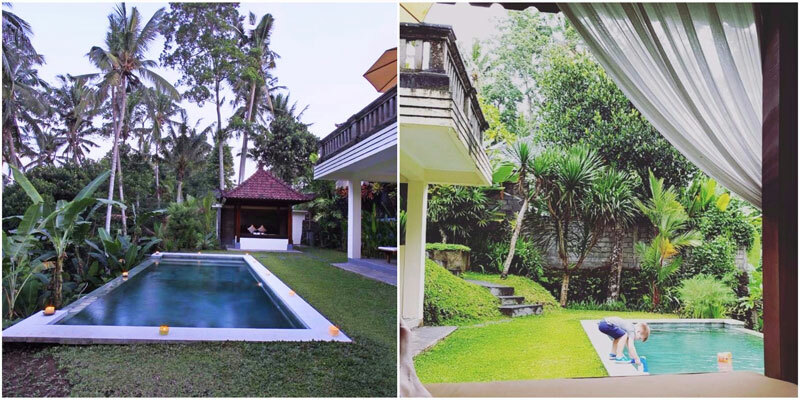 There’s even a scooter rental service at the villa, so you can also explore popular beaches a few kilometers away, such as Batu Bolong and Echo Beach! 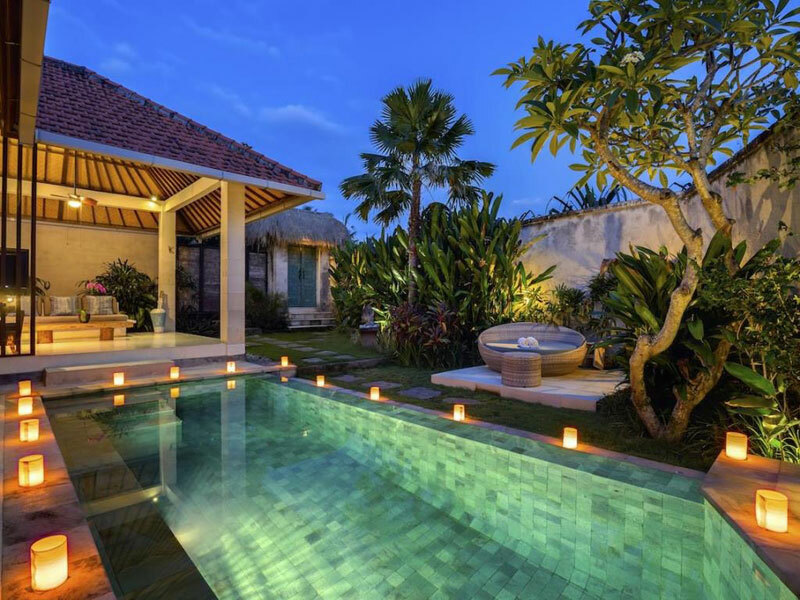 Nestled in sleepy Kerobokan, this complex is made up of 12 beautiful villas enclosed in a private and secluded residence. 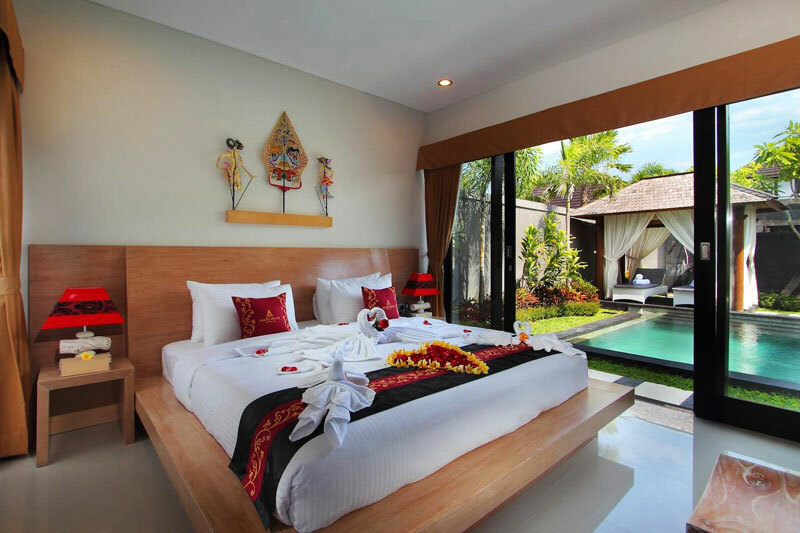 With a private pool and wooden sundeck decorated with hanging greenery in each Balinese-style villa, you can enjoy a luxuriously furnished and spacious living room, and super king-sized beds. 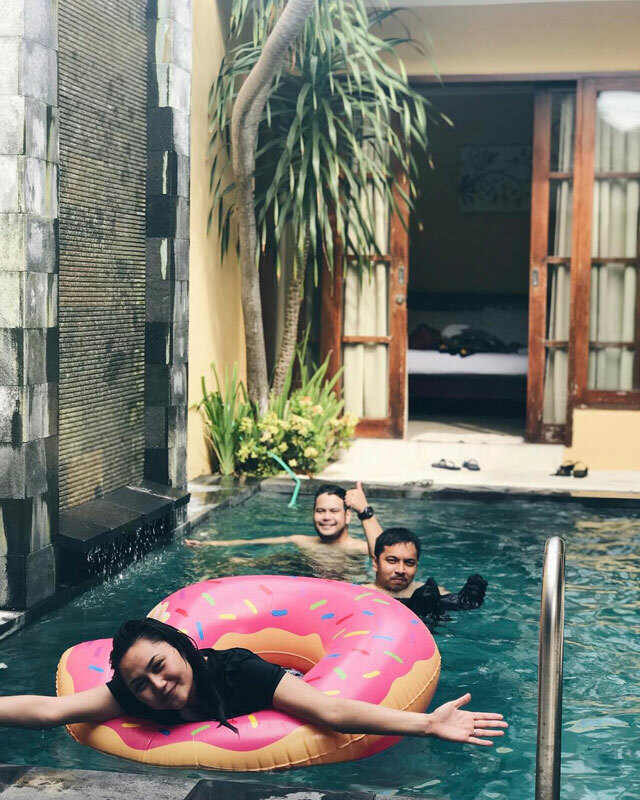 Although the complex is tucked away from the hustle and bustle of Bali, the available car service can bring you quickly to the centre of all the fun. Some of the best nearby attractions are the Taman Segara Madu Recreation Park and Finns Recreation Club with its lively family entertainment centre – guaranteed to excite your little ones! 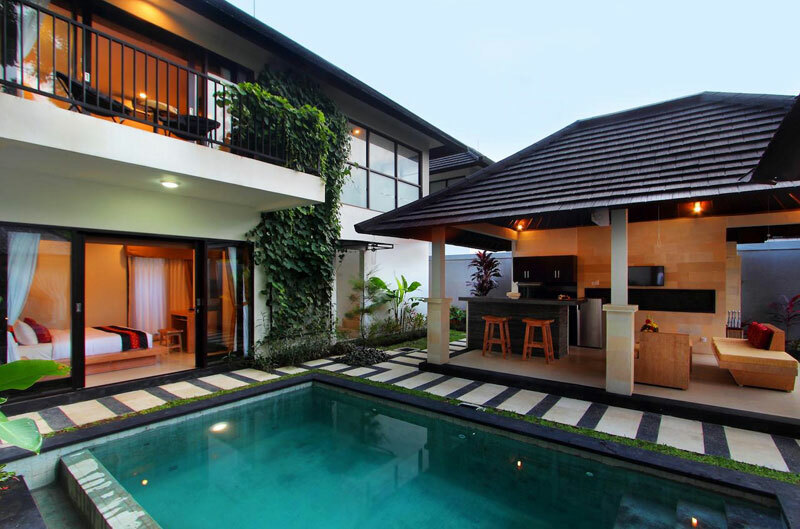 Although Agata Villas is perfectly nestled in a quiet area of Seminyak, the main shopping areas dotted with restaurants, bars, and supermarkets are still within walking distance. 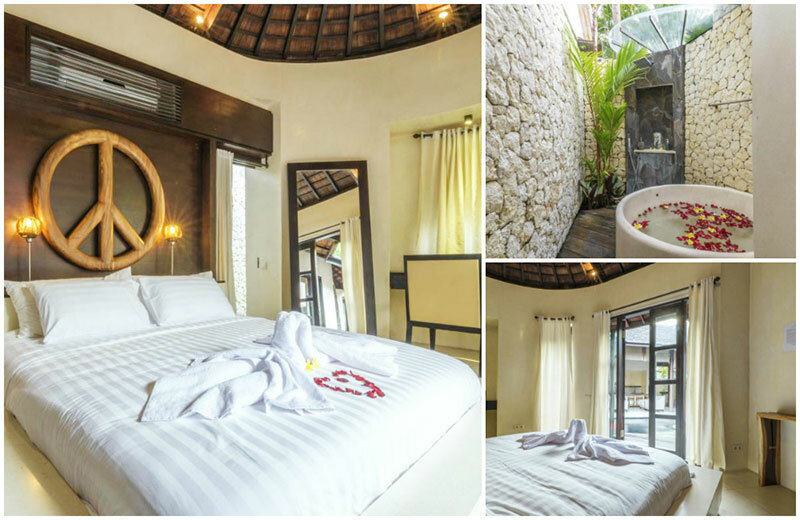 The property complex is made up of two-bedroom villas with modern architecture that prioritises comfort and privacy for its guests. 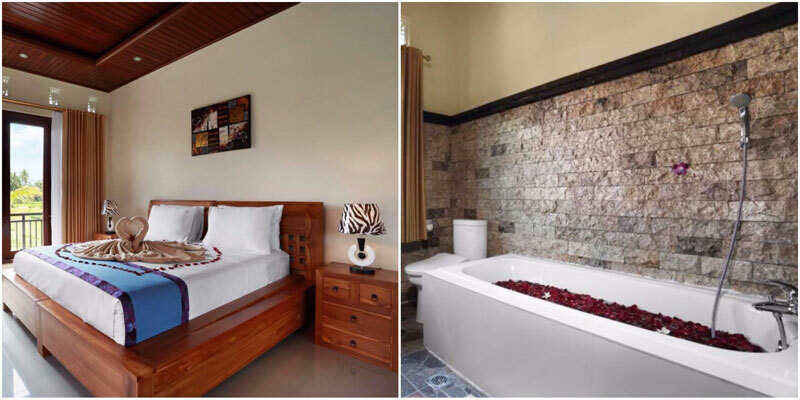 If you happen to have teenagers in the household, they will love the separate rooms, each one located on the upper and lower floor of the villa respectively, so they can get the privacy they want while still being in the same family villa. But the kids won’t keep to themselves for long, as the private pool is simply too inviting, especially after a hot day under the sun! 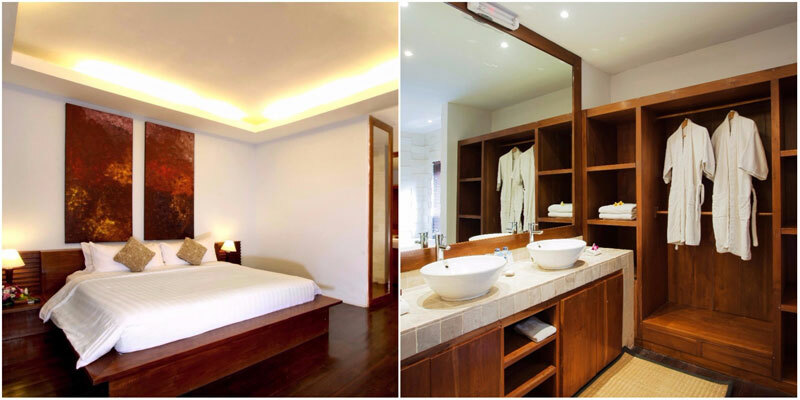 Words and pictures can’t do Rumah Tamu justice – you have to see it for yourself. The property consists of three fairylike buildings – pink polygons with roofs like pointed caps. One is a shared dining area, another for the master bedroom and a bathroom (and check out the cute pool next to it), and a third consisting of two single bedrooms, a bathroom, and a kitchen. 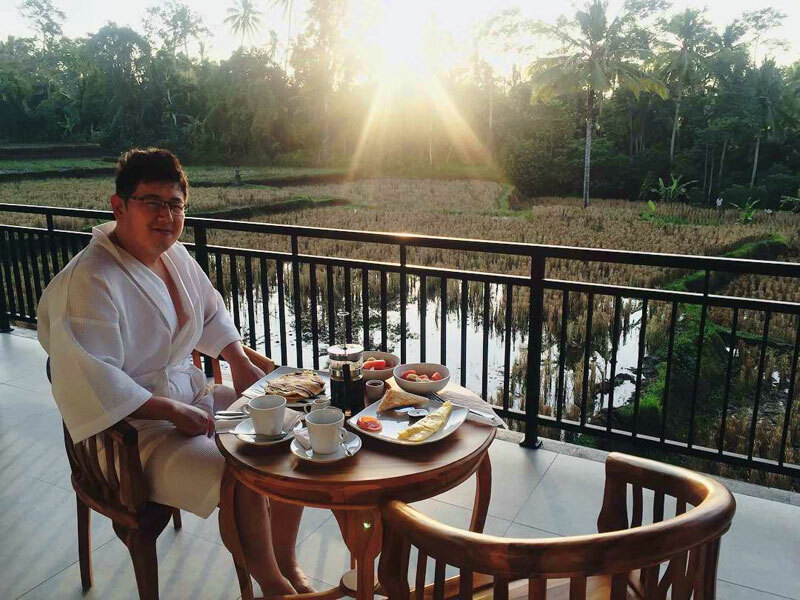 There’s also a patio where you can sprawl out and soak in the sight of the river and rice fields. Other magical elements around Rumah Tamu are fish ponds, fountains, pictographs, pterodactyl wood carvings, human and animal figurative statues and murals that look like cave paintings. It’s very atmospheric: you can pretend to be cave-people when your son asks you what love is – grunt and give him the sweeter coconut. If you feel like exploring the world outside Rumah Tamu. 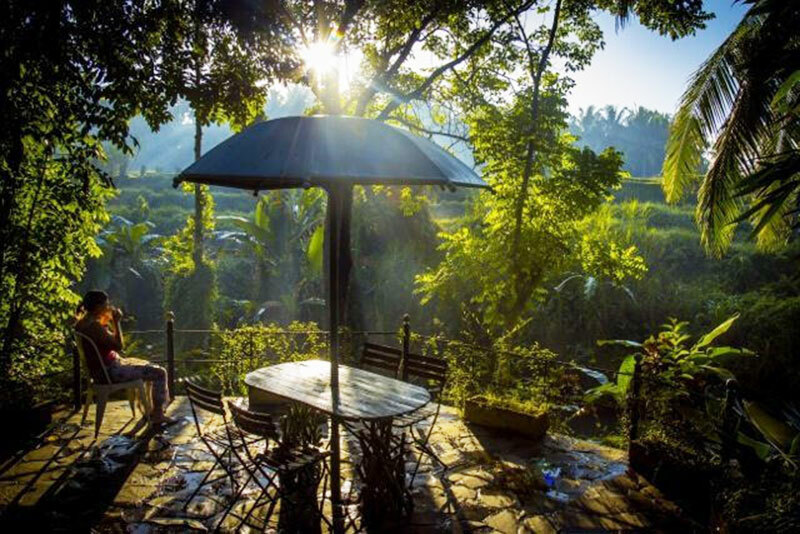 it’s only a 15-minute car journey away from Ubud’s best – famous restaurants, museums, markets, dance performances and nightlife if you’re up for it. 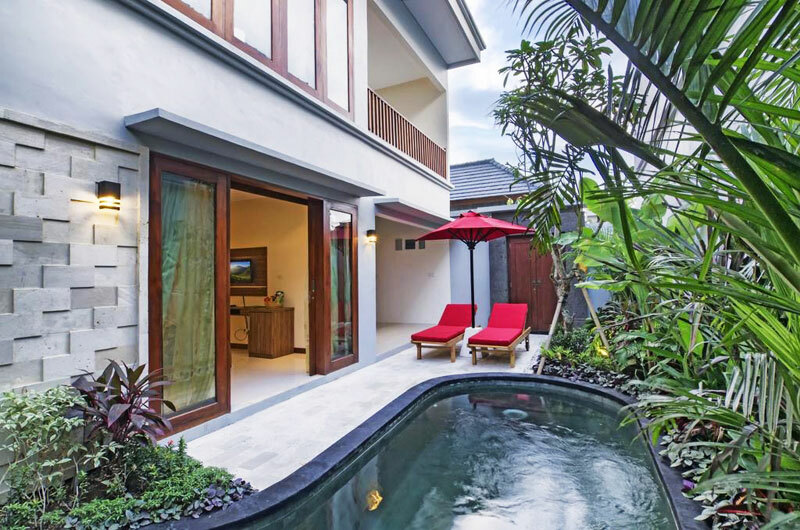 A family holiday in Bali doesn’t need to be stressful nor expensive – these value-for-money two-bedroom villas will please both the young and young-at-heart! Do you have other affordable villas with private pool to recommend? Do share with us!